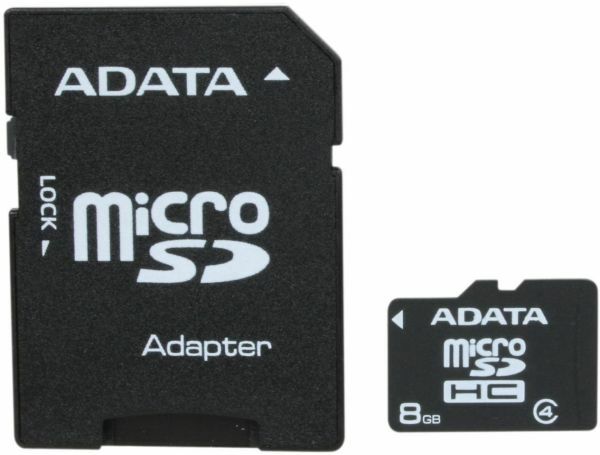 Adata 8GB microSDHC Card with Adapter is undeniably one of your ultimate memory solutions. This microSDHC card by Adata is a must have for mobile phones.The Adata 8GB microSDHC Card with Adapter is undoubtedly an improved and top notch solution to all your memory issues. As the demand for digital storage devices grows, the 8GB microSDHC Card by Adata takes the microSD category to the next level with its brilliant performance. Adata brings you this 8GB microSDHC card that features a new interface that enables faster transfer rates. It provides cellular phones with even more memory storage to store your multimedia, business, and personal data. Thanks to its 4MBps transfer rate, this 8GB class 4 microSDHC card makes for the perfect choice for micro storage devices. The 8GB microSDHC Card brought to you by Adata ensures extra memory storage to save your multimedia, business, and personal data. Its 4MBps transfer rate makes for the perfect choice for micro storage devices. Watch the performance at its best with this Adata memory card when the demand for digital storage devices grows. Its new interface enables faster transfer rates. Adata’s 8GB microSDHC Card with Adapter is aptly engineered for brilliant compatibility with smartphones. It lets you store your favorite songs, beautiful memories, and valuable data, all in one place.